1, 2. Fragments collected at low intertidal fringing coral reef of Sesoko Island. 3. Habit in aquarium (Sesoko Island, Okinawa, Japan).. 09 Mar 2012. Eduard and Tamara Titlyanova. © Eduard and Tamara Titlyanova (etitlyanov@mail.ru). Cladosiphon okamuranus Tokida 1, 2. Fragments collected at low intertidal fringing coral reef of Sesoko Island. 3. Habit in aquarium (Sesoko Island, Okinawa, Japan). Published in: Tokida, J. (1942). Phycological observations, V. Transactions of the Sapporo Natural History Society 17: 82-95. The type species (holotype) of the genus Cladosiphon is Cladosiphon mediterraneus Kützing. Nishitsuji, K., Arimoto, A., Higa, Y., Mekaru, M., Kawamitsu, M., Satoh, N. & Shoguchi, E. (2019). Draft genome of the brown alga, Nemacystus decipiens, Onna-1 strain: Fusion of genes involved in the sulfated fucan biosynthesis pathway. Sceintific Reports 9(4607): 1-11, 6 figs. Saito, H., Xue, C., Yamashiro, R. Moromizato & Itabashi, Y. (2010). High polyunsaturated fatty acid levels in two subtropical macroalgae, Cladosiphon okamuranus and Caulerpa lentillifera. Journal of Phycology 46(4): 665-673. Shibata, H., Kimura-Takagi, I., Nagaoka, M., Hashimoto, S., Aiyama, R., Iha, M., Ueyama, S.,& Yokokura, T. (2000). Properties of fucoidan from Cladosiphon okamuranus tokida in gastric mucosal protection. Biofactors 11: 235-245. Shinmura, I. & Yamanaka, K. (1974). Studies on the cultivation of an edible brown alga, Cladosiphon okamuranus I. The season for seeding of zoospore and its growth. Bull Jap Soc Sc Fish 40: 895-902. Shinmura, I. & Yamanaka, K. (1974). Studies on the cultivation of an edible brown alga, Cladosiphon okamuranus II. Field culture experiments with a culture net. Bulletin of the Japanese Society of Scientific Fisheries 40: 1133-1138. Shinmura, I. & Yamanaka, K. (1974). Studies on the cultivation of an edible brown alga, Cladosiphon okamuranus III. Development of zoospores from plurilocular sporangium. Bull Jap Soc Sc Fish 40: 1213-1222. Shinmura, I. & Yamanaka, K. (1975). Studies on the cultivation of an edible brown alga, Cladosiphon okamuranus IV. Development of zoospore from unilocular sporangium. Bull Jap Soc Sc Fish 41: 1229-1235. Shinmura, I. & Yamanaka, K. (1976). Studies on the cultivation of an edible brown alga, Cladosiphon okamuranus V. Conjugation of gamete and development of zygote. Bull Jap Soc Sc Fish 42: 21-28. Shinmura, I. (1976). 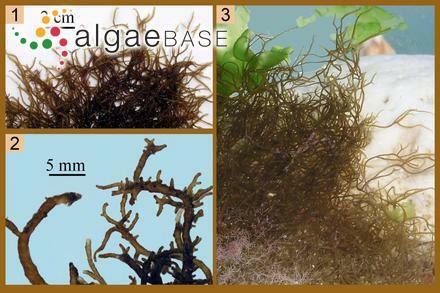 Fundamental studies on the cultivation of an edible brown alga, Cladosiphon okamuranus. : 1-64. Shinmura, I. (1977). Life history of Cladosiphon okamuranus, Tokida from southern Japan. Bulletin of the Japanese Society for Phycology 25: 333-340. Tako, M. (2003). Rheological characteristics of fucoidean isolated from comercially cultured Cladosiphon okamuranus. Botanica Marina 46: 461-465. Tako, M., Yoza, E. & Tohma, S. (2000). Chemical characterization of acetyl fucoidan and alginate from commercially cultured Cladosiphon okamuranus. Botanica Marina 43: 393-398.